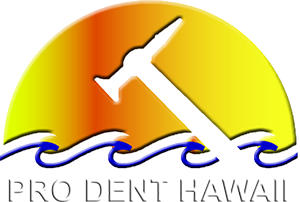 Pro Dent Hawaii provides the finest in paintless dent repair and door ding removal service you can find. With years of experience, you don't have to worry if you will still see your dent. We provide the utmost craftsmanship and care when performing the art of paintless dent repair on your vehicle. Paintless Dent Repair or known as PDR, is the fastest, most efficient and cost effective method for removing door dings, creases, hail damage and minor dents without using paint or fillers. Our paintless dent removal services are usually completed within 60 minutes or less. But don't let our swift service fool you that pdr is easy. It's not. Matter of fact paintless dent removal takes years to master and we still teach ourselves new techniques as times and vehicles change. It's important you do your research about PDR before you just choose anyone to work on your car or truck. Note: You only have one good chance to make it right the first time, so choosing a company based on a low price alone is a big oversight. Our dedicated team at Pro Dent Hawaii is completely mobile who can remove your door dings or dents at your home or work place. Once our in uniform PDR technician arrives, he will go over your vehicle and explain the repair process with a work order. When the PDR repair is completed, your inspection will finalize your satisfaction. In benefit, your car or truck is restored back to pre-accident condition without you even leaving your vehicle.